Jim McKnight, a native of Tampa Florida, comes to Florida State Hospital from North Florida Child Development where he has been employed as the Chief Operating Officer Inc. His previous work experience includes service as the Chief Executive Officer of Doctors' Memorial Hospital, the CEO North Florida Medical Centers, Inc. and Administrator of Crenshaw Community Hospital. Mr. McKnight is a graduate of Jesuit High School, and holds an AA degree in Liberal Arts from Hillsborough Community College, a BA degree in Psychology from The University of South Florida, and an MS degree in Health Services Administration from the University of St. Francis. Presently he serves on the Board of Trustees of Gulf Coast State College and is the chairman of the Gulf County Planning and Review Board and chairman of the Gulf County Republican Party. His charitable and civic contributions have included participation in the United Way Campaign, Relay for Life, Chamber of Commerce, Kiwanis Club and football and baseball coach at the youth and high school level. Past professional memberships include leadership roles in mental health, hospital and community health center associations' and boards. Annie D. Jackson has served as an Assistant Hospital Administrator at Florida State Hospital since July 1997 with her most recent appointment being that of Assistant Hospital Administrator of Operations. As the Assistant Hospital Administrator for Operations, Ms Jackson is responsible for the day to day operation of the five residential units at Florida State Hospital. The residential units serve individuals with civil and forensic commitments. Civil Services is comprised of 490 beds and Forensic Services is comprised of 469 beds. Individuals admitted to the Civil Services are Baker Act by the Court while those admitted to Forensic Services are court committed as Incompetent to Proceed or Not Guilty by Reason of Insanity. There are 832 Direct Care and Support employees in Operations. Mrs. Jackson has 22 years of experience with the Department, all of which has been at Florida State Hospital. During this time, she has held numerous positions at Florida State Hospital prior to her current position appointment, including Forensic Administrator, Assistant Administrator for Residential/Civil Services, Hospital Social Work Consultant, Mental Health Program Analyst/Team Coordinator, and Senior Human Services Counselor Supervisor. She received a Master of Social Work, as well as, her Bachelor of Science in Social Welfare from The University of Alabama and is licensed in the States of Alabama and Florida. She completed the Certified Public Manager's Program and the Certification in Gerontology from the Florida State University. Josefina M. Baluga, M.D., has served as the Hospital Clinical Director of Florida State Hospital since May 2006. As Medical Executive Director, she is responsible for the oversight of all Medical Staff, Nursing, Psychology, Dental Clinic, Clinical Laboratory, Outpatient and Specialty Clinics, Medical Services Unit and Emergency Room. She started employment with Florida State Hospital in January 2003; became Medical Service Director, Civil Service in 2005; then Hospital Clinical Director in May 2006. She is a Clinical Assistant Professor, Florida State University School of Medicine and a Clinical Preceptor, Barry University Physician Assistant Program. Dr. Baluga received her Doctor of Medicine degree from Cebu Institute of Medicine, Cebu City, Philippines and worked as a General Practitioner for the Ministry of Health, Philippines. She completed a psychiatry residency from the Southern Illinois University School of Medicine (SIU-COM) in Springfield, Illinois and worked in various roles including Associate Director of Psychiatry Residency Training Program, Assistant Professor in Clinical Psychiatry, Consulting Psychiatrist for The Hope School and the Macoupin County Mental Health Center. From 1998 to 2003, she completed physician peer reviews for CIMRO (Central Illinois Medical Review Organization), an independent peer review organization. Dr. Baluga holds active professional licenses in the States of Florida and Illinois. She is a Diplomate of the American Board of Psychiatry and Neurology. Jim Warren has served as the Assistant Hospital Administrator over Rehabilitation Services since 1995. He is responsible for the daily operation of six (6) departments that provide direct rehabilitative and substance abuse services to residents as well as training and management support services to employees. This includes the Rehabilitation and Substance Abuse Services, Social Services, Quality Service Planning, Staff Development, Quality Improvement Program and Volunteer Services. Under his direction, these areas take the lead on innovative initiatives such as CARF Accreditation and the Governors Sterling Award, Recovery Planning for providing hospital treatment services, Performance Improvement Scorecards and Management Performance Reviews, the introduction and development of Psychiatric Rehabilitation programs, development of the CompKit Competency Recovery Program, systematization of the Pharmacy and Therapeutics psychotropic medication review process and measurement system, Medication Cost Reduction planning, Hospital Annual Reports, Seclusion and Restraint use reduction strategies, and major problem solving, analysis and special report development projects for the hospital and departmental requests. Mr. Warren has 33 years of experience, all of which has been at Florida State Hospital. Prior to the positions with Administration, he worked as a Music Therapist, Rehabilitation Therapy Programs Supervisor and Unit Director. Mr. Warren has also served as the Residential Services Director for all Civil Services residential units and as Director of the Social Learning Program. He received a Bachelor's degree in Music Education from the University of West Florida, a Master's degree in Music Therapy from Florida State University, a Master's degree in Public Administration from Florida State University, and a Bachelor's degree in Religious Education from Gulf Coast Seminary School. The Office of General Counsel is the statewide legal office for the Department of Children and Families. Kathi Lee Kilpatrick represents Florida State Hospital and provides legal counsel and advice to the Senior Leadership Team regarding employment practices, discrimination, and discipline since October 2001. Mrs. Kilpatrick represents the hospital in administrative hearings involving the Baker Act, Title VII, ADA, FLSA, FMLA and the Whistleblower Act. She assists hospital administration in the ongoing development of operating procedures and training initiatives for institutional management, administrative services and human resources. Mrs. Barnes has served as the Human Resources Strategic Business Partner since August 2014. As the Business Partner, Mrs. Barnes is the local liaison for Human Resources Shared Services (HRSS), at Florida State Hospital (FSH), working with customers to improve HR experiences. As an HRSS staff, she is a collaborative member of the hospital’s Executive Leadership Team, working closely with FSH Administration, and others on strategic HR issues, initiatives, development of processes and tools, and facilitation of HR projects. The Human Resources Shared Services Center (HRSSC), located in Tallahassee, processes all transactional HR requests. HRSSC staff and Mrs. Barnes work hand-in-hand to answer questions and/or concerns from FSH staff and work with the DCF management team to find solutions to HR issues. Mrs. Barnes has worked for the Department of Children & Families for 26 years, and has been employed at Florida State Hospital for 20 of those years, serving as a Human Services Program Administrator at Unit 27, Unit Director at Unit 1 and Unit 24, Director of Professional Development & Training and Recruiting Consultant. Mrs. Barnes has a Bachelor of Science Degree in Social Work and Communication from Florida State University. She is also a Qualified Administrator of the Myers-Briggs Type Indicator Instrument, a certified Department of Children & Families Professional Trainer, completed the “Specialist Program” for Quality Management through Competitive Technologies International, the Lean Six Sigma Yellow Belt Course, is a recipient of a Davis Productivity Award of Distinction and is a graduate of the Certified Public Manager Program at Florida State University. Michael K. McCormick is a senior attorney employed at Florida State Hospital since March 1996. During the entire tenure of his employment at the facility, he has served as the Resident's attorney. As the Resident Attorney Mr. McCormick provides legal representation, primarily in the area of family and civil law, to residents undergoing treatment at the Hospital. Since July 1, 2011, he has served as the supervisor of the Resident Advocacy/Risk Management Department. This Department is responsible for the operation of a systematic resident grievance process and other related advocacy processes including Hospital wide Ward Government, management of resident drop in center, and responding and assisting external advocacy groups. The Department monitors and tracks Resident Injury and Events, conducts and leads Hospital wide safety meetings and monitors and tracks workers compensation incidents and claims. 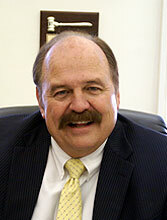 Mr. McCormick is a graduate of the Florida State University Law School. Teresa Tyson-English is the Resident Advocacy Coordinator for Florida State Hospital and has served in this position since 2014. As a member of the Senior Leadership Team, Ms. Tyson-English advocates and serves as the voice of residents to senior management. Ms. Tyson-English has the responsibility for overseeing the implementation of the Resident Grievance Process, the Critical Event Reporting Process, and the Abuse Investigation and Reporting Process. The Freedom House Drop-In Center for residents comes under the purview of the Resident Advocacy Office. Ms. Tyson-English acts as the liaison to external advocacy agencies such as the Disability Rights Florida. Ms. Tyson-English has 25 years of experience with the Department, previously working as a Manager for Professional Development and Training and Recovery Planning, a Unit Director and Program Director for Central Program Services. Ms. Tyson-English received a Bachelor of Science Degree from Presbyterian College in Clinton, South Carolina in 1988 and a Master's Degree in Music Therapy from Florida State University in 1991.